All roads led to St Michael’s Church Prasad Nagar on the evening of 15 June, 2015, Monday, when we Daughters of St Paul celebrated the Centenary of our Foundation Day!! The church was filled with people of all ages, colours, states and walks of life! From farthest ends of the diocese, priests and religious Brothers and Sisters joined in the celebration including staff members of Holy Family Hospital with their family members. Most Rev. Anil J.T. Couto, Archbishop of Delhi was the main celebrant, flanked by 22 priests who concelebrated. These included the provincial of the Jesuits – Delhi Province, Councillor of the South Asian Province of the Jesuits, the Chancellor of the Diocese, Financial Administrator, the Parish Priest of St Michael’s and Assistant, religious priests from among the Franciscans, Salesians, Capuchins, Dominicans, besides others from the archdiocese. A beautiful lively entrance hymn accompanied the procession of the Bishop, priests, lectors and Sisters who carried a lamp each with Intertwined-Flames logo of the Centenary, which they kept on the altar. The Holy Eucharist included an introduction by Fr Vincent Carmel, SSP recalling the history of the congregation and the role of the Daughters of St Paul in the world, readings in Hindi and English, to facilitate our Founder’s dream of reaching to all peoples through the Word, an inspiring and motivating homily by the archbishop, as he reiterated the role of the Daughters of St Paul in the Archdiocese of Delhi. He made the people aware how because of our work, books and literature which otherwise would be out of reach are made cheaper and easily available, and thus clarified our educative and teaching apostolate to the gathering. The Prayer of the Faithful brought forth universal and local needs before the Lord in a very creative manner. We offered a collection of Bibles and New Testaments and flowers besides the Bread and wine, which were carried by persons of different religious states and economic backgrounds. After the Eucharist we all gathered in the basement of St Michael’s Junior School – a whopping crowd of nearly 250 persons. The M.C for the programme was a member of the Parish youth group and she kept the gathering informed and going. A short and sweet welcome was accorded to the people and a warmer one to the Bishops present by handing of bouquets by two of our Sisters. This was followed by a Welcome Dance by Srs Edline and Vavinei Rita. The M.C. then gave a short history of the Daughters of St Paul in New Delhi and the present apostolate they are carrying out. This was followed by a 12 minute Documentary on the Daughters of St Paul which made clear to all, who these ‘Media Sisters’ are! The Logo of Intertwined flames was also explained with the help of a powerpoint, and the animated version constantly played as the backdrop. Bishop Kuriakose B.K. of the SyroMalabar Diocese (Delhi-Faridabad Eparchy) who was also present for the programme gave an inspiring message on the constant use of the media in our lives and how he too is constantly dependent on it to carry out his apostolic duties. After this the Sisters of the DSP community sang a centenary anthem, “Rejoice and Celebrate” prepared by Sr Helen dsp, accompanied by the keyboard which was played by, Ms Vanessa Pinto (Sr Helen’s grandniece) who had also trained the choir along with Sr Vavinei. No programme is complete without an expression of gratitude for all that has been accomplished. Sr Prema Maria, the superior of the community did the needful and thanked all those who had helped in some way or the other. The Grace before meals, prayed by newly appointed Parish Priest, Rev. Fr Arthur Pinto, was followed by a sumptuous meal. 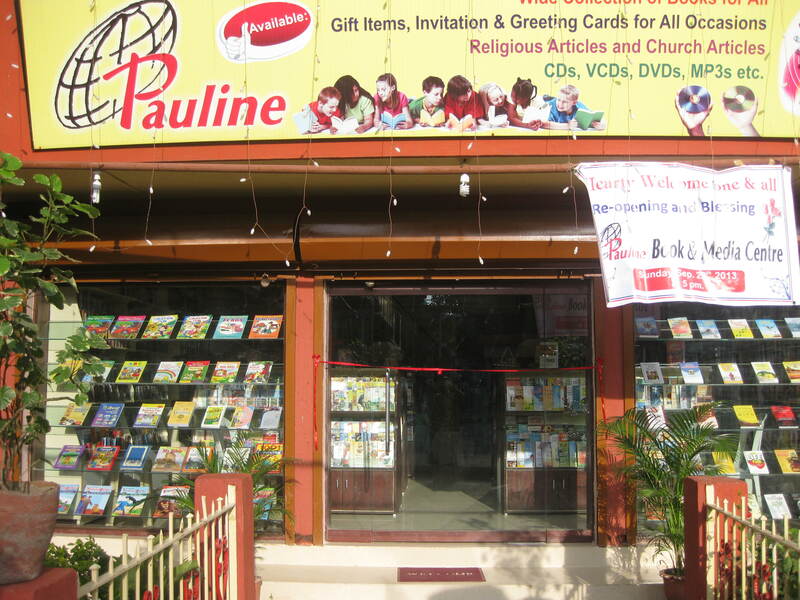 Every family, priest and religious community went back happy and with a memento which included some Pauline publications and a Souvenir prepared specially for the occasion. We are grateful to God for his faithfulness to us in the past 100 years and to all those who joined in our celebration of the same. We, 110 Vocation Promoters representing our dioceses and religious institutes from all over India came together at Pallotine Animation Centre, Nagpur from 12 to 15 November 2013 for a National Conference of Vocation Promoters. 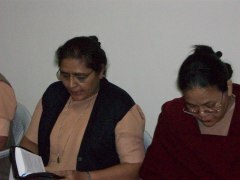 It was organized by the CCBI Commission for Vocations. The objective o f this conference was to sharpen the vision of the ministry of Vocation Promotion in India today and of creating a network for this all-important ecclesial task throughout the country with a missionary thrust. Bishop Thomas A. Vazhapilly, the Chairman of the CCBI Commission for Vocations, Seminaries, Clergy & Religious, and the resource persons, Fr. Paul Parathazham, Professor of Sociology, JDV, Pune and Fr. Amirthraj OP, Director, St. Dominic’s Ashram, Nagpur helped us to become aware of the reality of the ministry of Vocation Promotion encounters in India today and to envision the right perspective of Vocation Ministry in India today. Recent studies have brought to light some important concerns in the area of Vocations to Priesthood and Religious life in India. Participants were divided into seven groups and had lot of group work and sharing. At the close of our three day reflection and prayer, a group of 6 persons were chosen from the participants to draft the letter to the CCBI Commission for Vocation, to express positive experiences as well as the difficulties we face in Vocation Promotion. Positives: Church in the forefront for humanitarian work; while there are a few dioceses and Religious Institutes which have a sufficient number of priests and candidates to the priesthood and religious life. A lot of missionary work is being done, dedicated work of caring, etc… But many others are facing difficulty in this area. Preference among priests and religious for work in institutions, not willing to leave their comfort zones, and not willing to take up the Mission of evangelization. The Archbishop from Nagpur Rt. Rev. Abraham reiterated what all the speakers have said that vocation is the duty of every Christian. He emphasized that the commitment of the vocation promoters does not end with recruitment but they should continue to accompany them in their formative and life journey. Though the evangelizing mission of the Church is in need of a great number of Vocations the quality should not be compromised. Looking for quality will not only attract better candidates, but will also ensure better formation and effective and credible leadership in the Church. Since Vocation Promotion is one of the most vital ecclesial tasks, there should be a Commission for Vocation in every diocese/Congregation consisting of all sections of the People of God, especially the Laity. As far as possible a full-time Vocation Promoter or a Coordinator of vocation activities should be nominated, trained and supported at all levels. Vocation coordination should be carried out at the national, regional and diocesan levels, with adequate infrastructures for the same. The dioceses and religious institutes should observe a policy of opening its doors for vocation promotion to all mission territories and religious institutes. While carrying out the ministry of vocation promotion, emphasis should be laid on the Mission of the Church at large and the mission/charism of the diocese/Institute in particular. Though the family background is an important factor in the selection of candidates, the quality and disposition of the individual should be given due recognition. While evaluating the fitness and eligibility of the candidates in respect to their life, the vocation promoter should be positive about the candidate’s ability to transcend his/her past failures. The family being the seedbed of vocations, great care should be given to foster a relatively larger number of children in every family. In this regard the pastoral, economic and educational care of the families should also be taken into account. Existence of large families will ensure sacrifice and generosity in family relationships, which will further help in the increase of quality vocations. Fostering of Vocations: The ministry of Vocation Promotion presupposes the fostering of vocations at all levels within the Church: by priests, religious and the laity; by pious associations, groups, BCC/SCC and through all activities of the parish such as catechism, homilies, family visits, schools, etc. 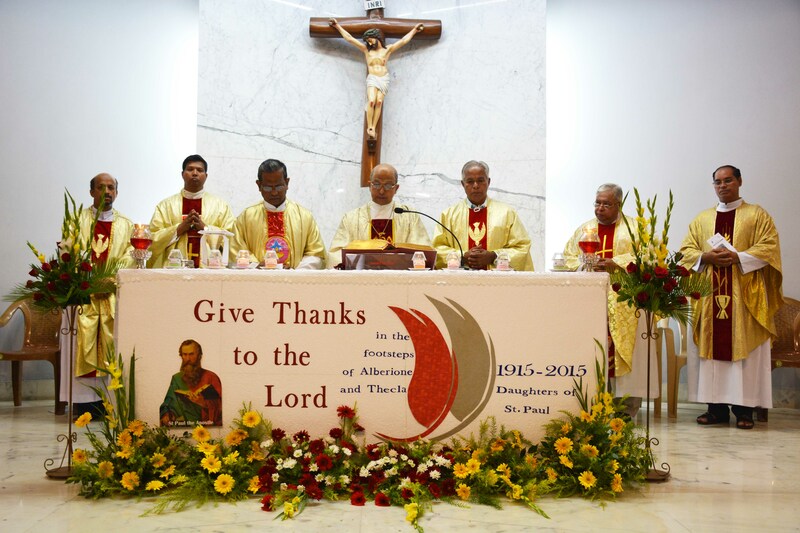 The session concluded with a Solemn Eucharistic Celebration by Rt. Rev. Bishop Abraham, Archbishop of Nagpur. I thank Sr. Ancy John and team for giving me the opportunity to participate in this Conference. The first ever National Convention of Small Christian Communities of India was truly an experience of a new Pentecost. The three-day Convention which was held in Goa (Bom Jesus Basilica, Old Goa) from 19—21 November 2013, was attended by over 7,000.00 (seven thousand) participants from all over the country. His Excellency Salvatore Pennacchio, Apostolic Nuncio presided over the inaugural Eucharist which was con-celebrated by around 80 bishops including a number of Archbishops and a large number of priests from different parts of India. The inaugural ceremony with the traditional lighting of the lamp was shared by different political dignitaries of Goa like the Governor and the Chief Minister. The first and third days of the convention were full of input sessions, sharing and presentation by individuals and groups, singing and praising God. On the second day, the participants were presented with an experience of visiting a deanery each in Goa where they participated in a rally along with the local delegates and visited homes and had Gospel sharing and concluded the day in a parish with different programmes. The first presentation was by Most Rev Filipe Neri Ferrao (Archbishop of Goa and Daman) on SCCs : a home and school of communion and faith. The second presentation was by Most Rev Selvister Fonnuntham, bishop of Punalur on the theme of The power of SCCs to Evenaglize the neighbourhood. Most Rev Bosco Penha, Aux. Bishop Emeritus, Mumbai talked on SCCs: an antidote to a culture of individualism, competition and consumerism. Bishop Bosco Penha exhorted the convention to change our mentality and attitude in three areas: viz. a) from individualism to community b) from consumerism to sharing c) from materialism to God. A few of the eminent SCC Pioneers in India were called on stage and were honoured with a shawl and words of appreciation. Bishop Bosco Penha was named the ‘Father of SCCs in India’. Rev Fr Vijay Thomas, a Pallottine priest in Nagpur is one of the stalwarts of SCC in India and he organizes regular one month training programmes for all those who would like to work with SCCs. The report states that at present the Indian Church has 6,8105 (Six thousand eight hundred and five) SCC units excluding the ones of the Syro Malankara Church which may number about 300 or above. The afternoon of the first day witnessed a talk show by Fr Felix D’Souza of Mumbai Diocese with a panel of SCC Pioneers which was truly interesting and informative. There was also a moment in the programme when the convention paid homage to late Rev. Fr Paul Puthanangady who was one of the stalwarts of inculturation of Indian Church and a strong promoter of SCCs in India. Archbishop Abraham Viruthukulangara, Archbishop of Nagpur called him the steel man of the Indian Church and a prayer was offered by Most Rev Ignatius Mascharenhas, the bishop of Chandigarh. After the initial prayer and warming up, the third and concluding day began with a spontaneous sharing of reports from the 28 deaneries across Goa where the delegates had been on the second day. The sharing poured in with a lot of joy and enthusiasm after which there were presentations by different regional groups about how the SCCs help in their life of Christian faith. All of them emphasized how Gospel sharing and celebration of the Eucharist in the SCC groups helps them to live their daily lives and the way God works through simple ordinary people. Their bond of love is strengthened each day and they narrated how SCCs help them to live the real values of Christian living and it definitely resembles the life of the early Christians. There were many instances where the SCC groups managed to pool in their resources, time and effort together to achieve goals like helping the people who are affected with natural calamities, building churches and community halls, ensuring rightful political benefits etc. The Convention was also marked as an official conclusion of the year of faith in India as designed by CBCI. His Eminence Oswald Cardinal Gracias of Mumbai, signified the closing by a symbolic gesture of closing of a specially designed door at the backdrop of the stage. In his message, the Cardinal expressed amazement at the number of programmes organized around the country during the year of faith and also praised the role of SCCs as the instrument and locus to come to know Jesus and to witness to him in the world today. Most Rev Thomas Dabre, Bishop of Pune who is also the chairman of the National Service Team of SCC, proposed a vote of thanks. The experience of hosting the two thousand delegates hailing from outside Goa in Goan homes which offered them hospitality and care itself was one of returning to the spirit of the early Christian communities. The well-organized programme and the conducive atmosphere of the place (especially in the vicinity of the sacred remains of the great missionary St Francis Xavier) helped to make the whole experience of the convention a memorable one for the participants. There was a theme song composed and a dance prepared for the occasion and different dances and programmes added colour and liveliness to the convention. There were CDs and books released on the occasion and a few souvenirs were put on sale. The event was well covered by the media. A local TV channel (HCN) aired live telecast and the local newspaper published write-ups every day of the event and prior to it. The convention concluded on a happy and hopeful note that the SCCs in India will further re-invigorate the Church in India and will act as “the Church in Miniature in the Neighbourhood”. Dr. Abdul Kalam says, “The dream is not that you see in sleep, dream is which does not let you sleep”. Yes dear friends, we had a dream and a great desire to make our centre more spacious, more attractive and a place of light and warmth. And this dream didn’t let us sleep until it is accomplished. And today our hearts are full of gratitude to God for all the blessings He has bestowed on us to make this dream a reality. 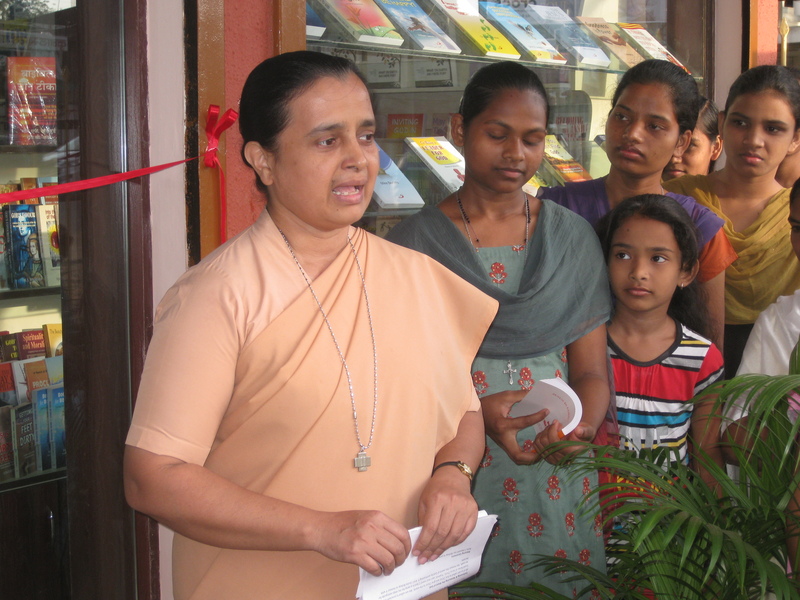 On 29th September 2013 at 5p.m we had the blessing of our renovated centre by Most Rev. Archbishop Abraham Viruthakulangara. The ceremony began with the welcoming of the bishop with an aarathi after which Sr. Elsa welcomed the gathering with the words of our Founder Bl. James Alberione saying, our Centres must be centres of light and grace to enlighten and animate people. It is also a Holy place where the proclamation of the Word is done through various means. Our pre-postulants welcomed the gathering with a melodious welcome song. Sr. Matilda D’Souza the M.C of the day made the people aware of the choice we had to make 28 years ago when we were invited by the two bishops i.e Bishop Valerian of Pune and bishop Leobard of Nagpur. We made a choice of leaving behind the 50,000 Catholics and opted to serve the people of Nagpur. It had been indeed a struggle and a journey of faith to bring up to this stage. After the brief introduction we had the lighting of the lamp followed by enthroning and honouring the Word of God. Bishop in his short message appreciated the mission of the Daughters of St. Paul, and thanked the sisters for their dedicated service to the diocese. We thank Sr. Ancy for her message and the team for all the moral and financial support extended to us. We are very grateful Sr.Matilda for all the help and valuable suggestions given to us. At the end of the programme Sr. Nancy proposed the vote of thanks and introduced the membership card. As a take away gift all were offered a copy of the Hindi N.T. and light refreshment was served. We also offered special discount on books and Bibles on this auspicious day. All were very appreciative of the new set up. Once again we are very grateful to Fr. Luciano and some of the communities for providing us financial help. We are indeed indebted to all of you. I experience God’s active, living presence, leading hands and healing touch in every moment. He lives in me, in my belief, in my heart’s desire, in my thoughts, in my words and in my actions. One of the proofs of it I can say, when my mother was at the point of death, and I said to Jesus,‘ Lord I trust in you and I believe that you will let me see my mother being alive because you always fulfilled my heart’s desire ever sinc e I was very young and if you wish you can make her well again too. It was his will that my mummy is now completely healed and he will give her a long, long life I believe. I was told that she has a very high fevour, infection in the blood, liver and kidneys, swelling of the heart and the C.T. scan report showed that she has a brain stroke. I was told that doctors have no much hope for her. When I reached the hospital where she was I told her and I asked, mummy I am neither a doctor nor a nurse I do not now what you are going through but I brought Jesus for you and so, do you believe that Jesus will heal you? I understood from her gesture saying yes, and that whole night she slept peacefully, she did not disturb anyone of us. While we were awaiting the vacancy to admit her in the ICCU. The very next day of my arrival I called a priest in bishop’s house and informed the condition of my mother, the priest came to the hospital by Jeep within 20 minutes and prayed over her. I saw her much better than the previous day, the following day Priest came with another four priests and prayed over her; meanwhile, my congregation’s sisters were calling from different communities enquiring her condition and also from abroad assuring their support of prayer. The condition of my mother was brighter and brighter day by day. 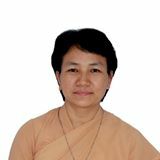 On the third day the assistant Parish priest of Don Bosco Imphal Chingmeirong came to say mass and gave her communion. You believed or not, on the fourth day she began to walk little by little. The senior most Doctor on his daily visit to my mum. Kept on telling me that it is a miracle that she is getting alright fast and he says, “to diagnosed such kind of illness takes not less than 18-20 days, for she has so many complications of sicknesses. On the 11th day she was discharged from the hospital. Surprisingly when we took her for MRI test after she had received the Holy Communion, the report was cleared that she has no brain stroked. Thank you Jesus for your love and compassion on her. She is now healed by Jesus physically and spiritually, quite well, doing her normal work, she can eat everything. God works in ways that we cannot see and understand, His ways are so wonderful. I experience God in every moment of my life, every event, every situation and every circumstances of my life. I am deeply grateful to the Trinitarian God, to Sr. Ancy John, Sr. Matilda and councilors, to Sr. Rosaria and community, and to all my sister of the province for your concern and support of prayer and everything. Thank you and God bless you all.